KTL Philadelphia owner, Perry O'Hearn trains a partial Turkish get up. This story was updated on March 7 to include a statement from KTL owner, Perry O'Hearn. The Philly small business scene is no stranger to storefronts being open one day and closed and boarded up the next. Closings happen, especially when the business isn’t doing well. 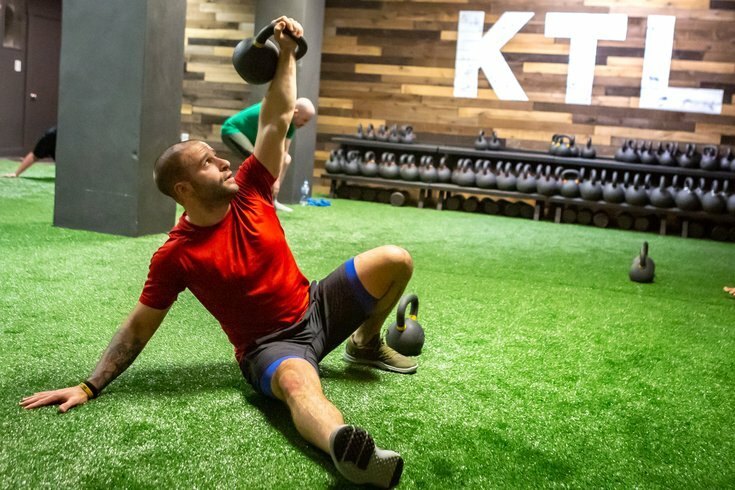 But this wasn’t the case when it comes to Philly’s first kettlebell small group fitness gym, KTL. The gym at 1822 Spring Garden St. opened in mid-December and made a splash in the local fitness scene — everyone wanted to try the kettlebell-only workout with an extreme emphasis on quality form while utilizing a trendy fitness tool. KTL offered daily classes and weekend workshops. Regardless, on the evening of Thursday, February 28, KTL owner Perry O’Hearn sent an email to members announcing the gym’s closure. PhillyVoice was led to believe this came as a shock to both members and trainers as there was talk of “tomorrow” at the gym that morning. With that information laid out, O’Hearn makes it seem like everything was going swimmingly. So why the closure? “The frustrating truth - it is because of me,” he explained. From there, he says it became a more time-consuming-than-expected project for him and felt torn between life and work. "Your passion and ability to help others should NEVER exceed your effort to help yourself" is a quote O’Hearn used to explain this dichotomy he was feeling that led to the end of KTL. “I know with time KTL would've blossomed into an amazing community – I mean it already has, but it would continue to grow. But as KTL would blossom, I would wither, and that is not something I expected…. and not something I am willing to sacrifice,” he said. The email also goes on to explain how things will be handled for members — how memberships, previous raffle prizes and more will be honored at O’Hearn's other gym, Philly Phitness, or reimbursed in time. "I realized that opening another gym didn't align with what made me truly happy. My wife and I are in the process of converting a 2018 Mercedes Sprinter and we are going to drive throughout the America's with our 2 dogs. I am in a place in my life where nothing matters more to me than work-life balance and having freedom to be present with my wife and our future family." Additionally, there has been no mention of the gym closing on KTL's Instagram or website.